The Eumer Crayfish tube is used, as its name implies, for making imitations of shrimp. You can tie, for example, the Francis imitations and/or bomber sinkers to this tube. The body has been formed into a wedge-like shape, making it easier to achieve the right final shape. 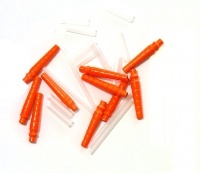 The tube comes in 2 different sizes and in 6 different colours.